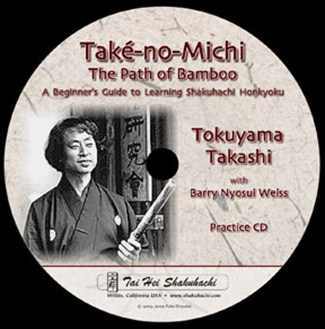 This is a shakuhachi teaching book and CD designed specifically for beginning students with no access to a teacher. Written in clear language, it covers the fundamentals of producing a sound and learning to play Kinko-ryu honkyoku. 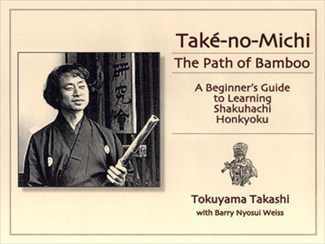 The keynote of this edition is “simplicity”, which is the essence of Tokuyama-sensei’s approach to shakuhachi. Chapters include information and advice on the structure and care of shakuhachi, practice, posture, breath, embouchure, how to hold the instrument, finger positions and making your first sound. It provides an explanation of the basic 5-note shakuhachi scale, timing and rhythm before teaching you how to produce each tone in both octaves. Several practice melodies are taught in a step-by-step method. Once the fundamentals are mastered, Tokuyama teaches the student some of the more nuanced aspects of playing Kinko honkyoku on the shakuhachi. He illustrates the proper head positions for meri and kari notes as well as special fingerings for the highest notes played on the instrument. Takahashi Tokuyama has studied with several senior shakuhachi masters, but aligns himself with no particular school. His recordings are entirely from the ancient traditional Japanese shakuhachi masterworks collection, the Koten honkyoku. In Tokyo, sensei Tokuyama leads a school for the study of traditional shakuhachi, the Honkyoku Study Group. Nowadays in Japan there are few people keeping this ancient musical tradition alive. Barry Nyosui Weiss began the study of Shakuhachi in 1974 with Ronnie Nyogetsu Seldin, a Dai shi-han (Grand Master) of the Kinko school in NYC. He received a Jun shi-han certificate and his Shakuhachi name “Nyosui” from Nyogetsu’s teacher, the late Kurahashi Yodo in Kyoto, Japan in 1980. Nyosui was awarded his Shi-han (or Master’s certificate) in 1981. For the last 14 years, he has been a principle student of Tokuyama Takashi in Tokyo. His focus has been to bring Tokuyama’s style and music to the West. Nyosui has taught and performed widely in this country and Japan. For over 25 years, he has shared his teachings of shakuhachi with the Zen Mountain Monastery located in Mt. Tremper, NY.